Find out what to do, whenever you come! Enjoy a pleasant stroll amid nature with outstanding views over the city, just a stone’s throw from the centre of Andorra la Vella. This linear, fl at walk of about 4km (there and back) passes along a little irrigation canal, which was built in 1880 and used to irrigate the orchards. If you want to learn more about what you see on this walk, do not miss the Green Ring information trails. They will show you the evolution of the agricultural and urban landscapes and how human beings have adapted their way of life to deal with natural risks. You will find all sorts of restaurants in the oldest part of the city. The wide range of cuisine on offer will satisfy all palates and budgets. 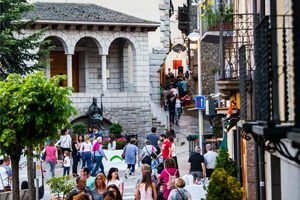 The old town in Andorra la Vella will take you on a journey throughXand discover the oldest areas of the city. The Casa de la Vall, Andorra’s old parliament building, is a must-see to understand the history and development of the country. Another unmissable site is the Sant Esteve Parish Church and its impressive organ. The great variety of shops you find there will be the icing on the cake! 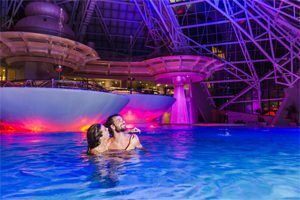 After an intense day, there is nothing like relaxing in the biggest thermal spa centre in Europe. Book your visit at the Andorra la Vella Tourist Office. Enjoy a pleasant stroll amid nature with outstanding views over the city, just a stone’s throw from the centre of Andorra la Vella. If you want to learn more about what you see on this walk, do not miss the Green Ring information trails. They will show you the evolution of the agricultural and urban landscapes and how human beings have adapted their way of life to deal with natural risks. The old town in Andorra la Vella will take you on a journey through time! Stroll around its cobblestone streets and discover the oldest areas of the city, its architectural monuments and its museums. The great variety of shops you fi nd there will be the icing on the cake! Andorra la Vella’s Historic Centre is home to the best cuisine and night-time entertainment in the Principality. Following the traditional paths of Santa Coloma and La Margineda, you will see some of the oldest and most distinctive monuments in the country. 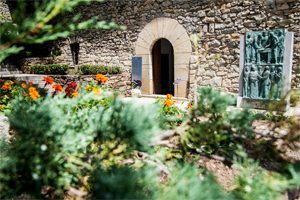 From Romanesque churches to archaeological sites to medieval bridges, you will learn plenty, not just about Andorran history, but Pyrenean history too. If Andorra is shopping heaven, then Andorra la Vella is the heart of it. 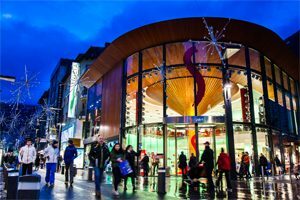 Do not miss the capital’s various shopping areas, where you will find all the most exclusive luxury brands, as well as more popular ones. Enter the Palomera woods on the shaded slope of Andorra la Vella and discover the magnificent Pyrenean autumn colours, as you follow a mountain valley trail declared a UNESCO World Heritage Site. Stroll around the streets of Andorra la Vella and enjoy the Roques al Carrer (“Rocks in the street”) museum, an open-air self-guided tour route where you will observe the great geological diversity of the buildings around you. Wonderful lighting makes the “7 Poetes” sculpture by Jaume Plensa and the Casa de la Vall an unmissable night-time tour! 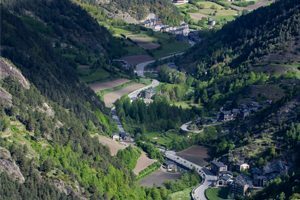 Arrive at the Ordino Valley after a 10-minute drive from Andorra la Vella. Charming landscapes, traditional villages and various museums will make your morning tour unforgettable. Set off from Ordino, heading to Canillo on the Coll d’Ordino road, a mountain road with views that give an idea of the immensity of the Principality’s valleys. On the road, do not miss the Roc del Quer viewpoint, a footbridge over the Canillo Valley where you will feel like you are flying! 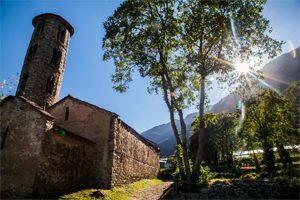 To end your tour, on the way back to the capital, stop at Meritxell, the small village that is home to the Sanctuary of Meritxell, Andorra’s patron saint. Autumn is the ideal season to enjoy the best typical local dishes. Check the brochure of the “Andorra a Taula” (Andorra at the dinner table) gourmet days and be inspired by what Andorra’s chefs have to offer. 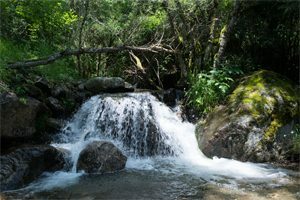 You cannot leave Andorra without visiting the Enclar Valley, one of the best places to observe Andorra’s native fauna. While you are in the area, you can also visit the archaeological site of Sant Vicenç d’Enclar. Fly down the longest toboggan run in Europe or glide down the Tubby and Minitubby slopes on a donut. 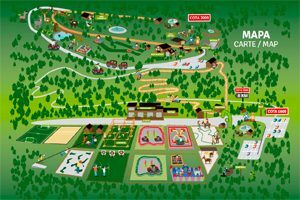 Do not miss all the fun activities this park in Sant Julià de Lòria has to offer. Enjoy the local cuisine on offer around the Avinguda de Meritxell, Fener Boulevard and Riberaygua i Travesseres neighbourhoods. Enjoy a pleasant stroll amid nature with outstanding views over the city, just a stone’s throw from the centre of Andorra la Vella. This linear, flat walk of about 4km (there and back) passes along a little irrigation canal, which was built in 1880 and used to irrigate the orchards. If you want to learn more about what you see on this walk, do not miss the Green Ring information trails. They will show you the evolution of the agricultural and urban landscapes and how human beings have adapted their way of life to deal with natural risks. You will fi nd all sorts of restaurants in the oldest part of the city. The wide range of cuisine on offer will satisfy all palates and budgets. July and August are the perfect time to make the most of the guided tours we offer. 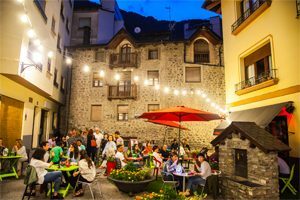 Immerse yourself in the culture, history and traditions hidden in every corner of Andorra la Vella. Check the brochure and choose the one you prefer. July and August are the perfect time to make the most of the guided tours we oer. 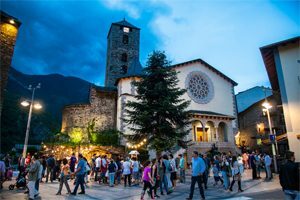 Immerse yourself in the culture, history and traditions hidden in every corner of Andorra la Vella. Check the brochure and choose the one you prefer. Who said ski resorts were only open in the winter? 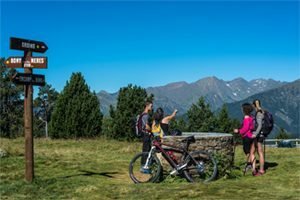 Grandvalira (Canillo and Soldeu resorts) and Vallnord (Pal and Arcalís resorts) offer plenty of activities in the summer: downhill mountain biking, enduro, ziplining, golf, activities for children and much more! 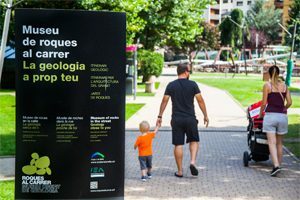 Stroll around the streets of Andorra la Vella and enjoy the Roques al Carrer (“Rocks in the street”) museum, an open-air self-guided tour route where you will observe the great geological diversity of the buildings around you. Afterwards, enter the world of motors at the World Champions by 99 museum. Thanks to Jorge Lorenzo, the MotoGP driver, experience the thrill of driving a MotoGP motorbike or Formula 1 car, and discover a great collection of unique pieces. Choose among the 7 routes on offer in the tourist bus guide and discover the most interesting spots in the country in a comfortable, fun way! Do not miss this opportunity to experience the mountains differently. Take a ride on the Funicamp cable car and enjoy the nature and landscapes around you from 2,550 metres up. Are you looking for a dierent kind of evening out? Then head to the Palau de Gel (ice rink) and combine your dinner with ice skating, ice hockey or even ice karting. 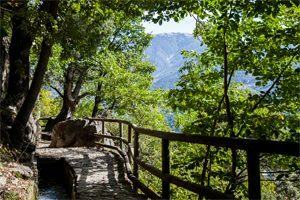 Enter the Palomera woods on the shaded slope of Andorra la Vella and discover the magnifi cent Pyrenean summer colours, as you follow a mountain valley trail declared a UNESCO World Heritage Site. Don’t forget anything! Before leaving the country, make the most of all the shopping opportunities Andorra la Vella has to offer: you will fi nd anything you need! 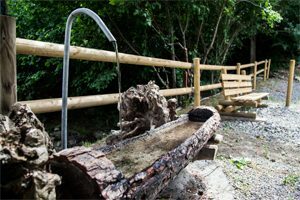 Enter the Palomera woods on the shaded slope of Andorra la Vella and discover the magnifi cent Pyrenean spring colours, as you follow a mountain valley trail declared a UNESCO World Heritage Site. Enter the Palomera woods on the shaded slope of Andorra la Vella and discover the magnificent Pyrenean spring colours, as you follow a mountain valley trail declared a UNESCO World Heritage Site. 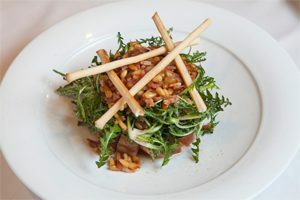 Dine in Andorra la Vella’s Historic Centre, home to the best cuisine and night-time entertainment in the Principality. Stroll around the Pardines Path and the Engolasters Lake. This pleasant, easy trail goes from the Cortals d’Encamp to Engolasters Lake. This 5.5km walk is scattered with waterfalls and botanical gardens. 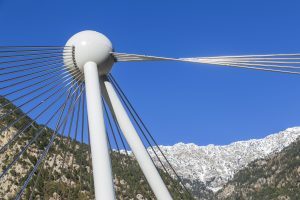 It is also home to a viewpoint with panoramas over the Encamp Valley and a lake with an adventure park, where little ones can try zip-lining or play some balance games. Visit the Thyssen Museum in Escaldes-Engordany and marvel at works by 19th and 20th-century painting masters. If Andorra is shopping heaven, then Andorra la Vella is the heart of it. Do not miss the capital’s various shopping areas, where you will fi nd all the most exclusive luxury brands, as well as more popular ones. 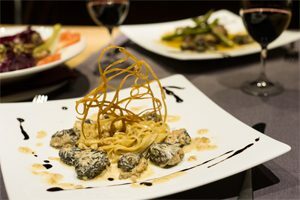 There is no better way to end your stay than by enjoying the range of cuisine on offer around the Avinguda de Meritxell, Fener Boulevard and Riberaygua i Travesseres neighbourhoods. Here you will fi nd more than 300km of slopes, where you can do much more than skiing. Discover one of the two biggest ski resorts in southern Europe at just a short distance from the capital. Buy your Grandvalira and Vallnord ski passes at the Andorra la Vella Tourist Office. The old town in Andorra la Vella will take you on a journey through time! Stroll around its cobblestone streets and discover the oldest areas of the city, its monuments, its architecture and its museums. The great variety of shops you fi nd there will be the icing on the cake! Discover one of the two biggest ski resorts in southern Europe at just a short distance from the capital. More than 90km of slopes, dozens of activities and plenty of delicious food await. Buy your Vallnord ski pass at the Andorra la Vella Tourist Office. Do some cross-country skiing, fly down the longest toboggan run in Europe or glide down the Tubby and Minitubby slopes on a donut. Do not miss all the fun activities this park in Sant Julià de Lòria has to offer. The small village of Pal is another key attraction in the northern valleys. Pal, a heritage site of cultural interest, offers a glimpse of traditional Andorran life. Later on, go to the “Coll de la Botella” (2,064 metres) and enjoy the breathtaking views. Dine close to the stars in one of two Vallnord restaurants open at night. Both El Pla de la Cot, in Pal, and La Coma d’Arcalís offer unique winter night experiences in the mountains. The biggest ski resort in southern Europe is just a 15-minute drive from central Andorra la Vella. 210km of slopes, activities for the whole family and a wide range of food options will make your day unforgettable. The Palau de Gel, or “Ice Palace”, offers activities for the whole family. Try the ice rink, where you can try your hand at skating, karting, quad biking or hockey. 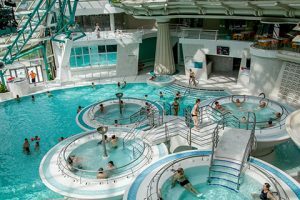 If ice skating is not your cup of tea, then relax in the heated swimming pool. Finish off your stay by dining in Andorra la Vella’s Historic Centre, home to the best cuisine and nighttime entertainment in the Principality.